Large-scale networks of neurons can exhibit localized and propagating oscillations. Spatially localized groups of neurons form an oscillating core that may emit a pulse each cycle – both in cortical slices treated with an inhibitory neurotransmitter agonist and in EEG recordings of seizures in humans. Previous modeling studies sought to explain such phenomena using non-locally coupled excitatory neuronal networks with local negative feedback . 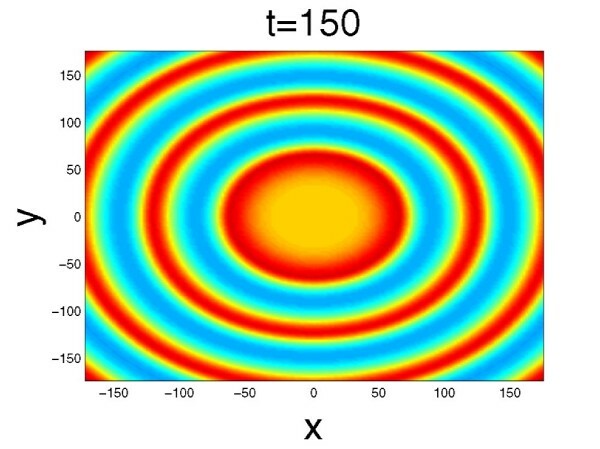 In a particular study with strong negative feedback, a limit cycle can exist in the space-clamped model, which translates to a localized oscillating pulse emitter in the spatially extended model . To characterize the detailed physiological role of negative feedback, we study oscillations in a spatially structured excitatory neuronal network with synaptic depression  and spike frequency adaptation . We employ two different types of firing rate function: Heaviside step and a piecewise linear. While the Heaviside function makes the model more amenable to analysis, the piecewise linear function matches experimentally observed frequency-input functions. Oscillations can arise due to competition between excitatory synaptic weighting and local negative feedback mechanisms. We first show that stable stationary bumps exist in the absence of adaptation. In the presence of an inhomogeneous stationary input, stable standing bumps exist in a wider parameter regime. By reducing the input amplitude, a Hopf bifurcation is induced, resulting in a breather. In the case of a piecewise linear firing rate function, we show that the network also supports self-sustained oscillations between an up state and a down state in the absence of external stimulation. Linear stability analysis of the space-clamped system indicates regions of parameter space wherein limit cycles exist. Self-sustained oscillations persist in numerical simulations of the spatially extended network. Following an initial localized stimulus, an oscillating core periodically emits pulses each cycle (Figure 1). Snapshot of synaptic input current in the two-dimensional network following an initial stimulus applied in the center of the domain. This work was supported by the NSF (DMS 0813677 and RTG 0354259).